Cambridge Ecology has experienced ecologists possessing Natural England Bat survey licences are able to undertake all types of Bat Surveys. We design our bat surveys to ensure that they follow recognised methodologies and guidelines. Only licensed bat surveyors are permitted to enter known bat roosts and/or to capture or handle bats. Initial Stage 1 Inspection surveys can be carried out at any time of year. The survey aims to identify the likelihood of bats being present within the development site. This type of survey involves an internal and external inspection of a building/tree/structure to search for bats or signs of roosting bats (such as droppings, staining, scratch marks or insect remains) and to assess the potential of the feature to be used as a bat roost site and the surrounding habitat to support bats. A background biological data search to check for records of known bat roosts within 2km of the site is also carried out. This Stage 1 Inspection survey and literature search can sometimes be enough to assess whether bats are likely to be present on the development site and whether they are likely to be affected by the development proposals. 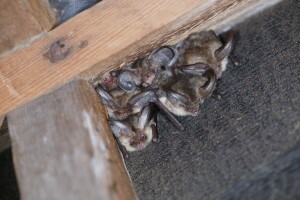 If results of the initial Stage 1 Inspection surveys and assessment indicate that bats and/or their roost sites may be affected by the development proposals, then Stage 2 bat surveys would typically be required to inform the planning process, the need for an EPSD licence and the type of mitigation required. For licensing purposes Stage 1 and Stage 2 survey methods are required to determine the likely presence/absence of bats and the type of bat roost present. Where a development is likely to have an impact on a known bat roost, and where avoidance of that impact is not possible, mitigation works will be required. Mitigation measures would likely involve the replacement and or enhancement of roosts affected development. sell, offer for sale, possess or transport for the purpose of sale (live or dead animal, part or derivative) or advertise for buying or selling such things. Roosts are protected even if no bats are present. If convicted of an offence the penalties can be severe, including a fine of up to £5000 (per animal) and/or six months in prison. Some bat species, including Barbastelle, Bechstein’s, Brown Long-eared, Common Pipistrelle (Wales only), Greater Horseshoe, Lesser Horseshoe, Noctule, and Soprano Pipistrelle are also priority species under the UK Biodiversity Action Plan. Many species of bats are Section 41 priority species under the terms of the NERC Act 2006. For more information please get in touch or call 01954 231239.